The Countdown to CAMX 2017 Is On! We’re Excited to Showcase a Variety of Specialty Ingredients at CAMX 2017! Only two weeks away and we’re already excited and looking forward to visiting sunny Orlando, Florida in December for the 2017 edition of The Composites and Advanced Materials Expo (CAMX). Originally scheduled for September of this year, the event unfortunately was postponed due to Hurricane Irma, but we’re pleased to report the area withstood any damaging effects of the storm and CAMX will be held Dec. 12-14. 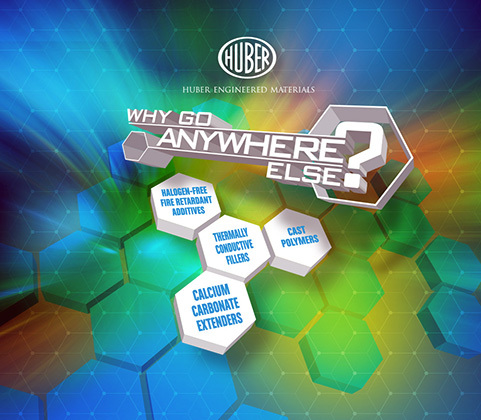 The Huber team will be in booth E2 near the front entrance of the venue at the Orange County Convention Center promoting a number of engineered specialty ingredients, including the less abrasive Hubercarb® W4 Calcium Carbonate; our array of Halogen-Free Fire Retardant Additives; an appealing variety of Cast Polymer Performance and Solid Surface Materials; and the exclusive line-up of Martoxid® TM Thermally Conductive Fillers to help you cool things off! Also headlining our presence will be a Special Technical Presentation Wednesday, Dec. 13 at 1 pm introducing our Martoxid TM Thermally Conductive Fillers. You are cordially invited to join us for the approximate 25-minute presentation being held on the CAMX show floor at the Innovation Park Theater. We look forward to seeing you in Orlando and cordially invite you to stop in and visit us in booth E2! We love it when pictures tell the story! 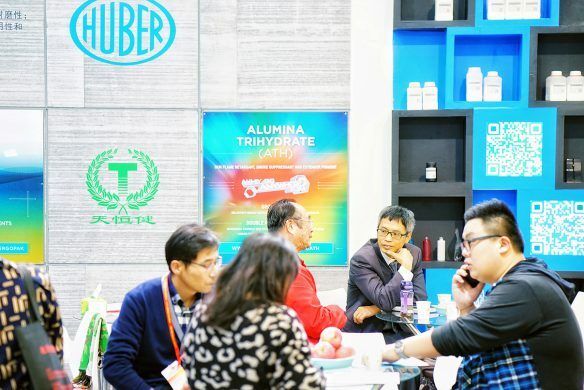 There was plenty of buzz and robust activity this week around our booth at CHINACOAT 2017, held at the Shanghai New International Expo Centre (SNIEC). Our Huber Asia Pacific team was excited at the prospects coming into the week and the number of attendees stopping by our booth didn’t disappoint! We enjoyed sharing our hospitality while discussing our Pergopak® Organic Flatting and Matting Agents and Alumina Trihydrate (ATH), the versatile flame retardant, smoke suppressant and extender pigment we offer in a variety of coatings-related applications. 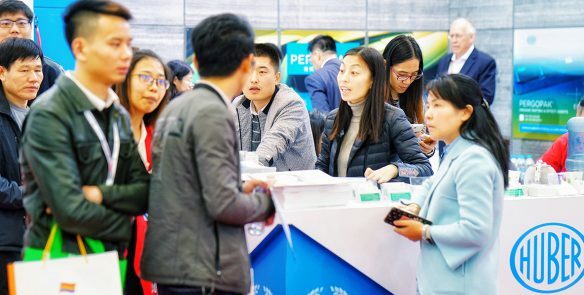 We appreciate everyone who stopped by our booth during the three days of CHINACOAT. There were a lot of smiles, comradery and information shared. We look forward to following up with everyone and discussing the high performance offered by our products while also showcasing our superior technical service expertise and customer care support. Stop By and Meet Huber’s Winning Team at CHINACOAT! We cordially invite you to join us in Shanghai Nov. 15-17 for CHINACOAT 2017. 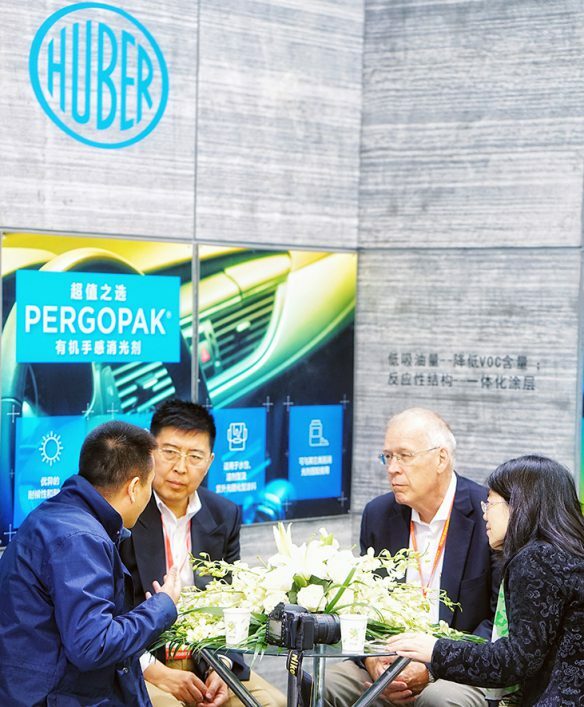 Our Asia Pacific Huber team is looking forward to welcoming you into our space located in Hall E6, Booth B13-16. We are showcasing our Pergopak® Organic Flatting and Effect Agents and Alumina Trihydrate (ATH), the versatile flame retardant, smoke suppressant and extender pigment we offer that’s used in a variety of coatings-related applications. Our exclusive Pergopak products are organic thermoset polymethyl urea resins (PMU). They allow the creation of surface properties and visual effects, which cannot be achieved by standard matting agents like silicas or waxes. We offer four grades in varying particle sizes. Two types of ATH are available, Ground and Double Precipitated. Ground ATH has a relatively broad particle size distribution and is economical. Double Precipitated ATH has a narrower particle size distribution with a relatively low surface area along with high purity and very high whiteness and brightness. We’re very interested in learning more about your application and how our products can work for you to enhance your product’s surface properties and physical effects. We look forward to seeing and visiting with you next week in Shanghai at CHINACOAT!